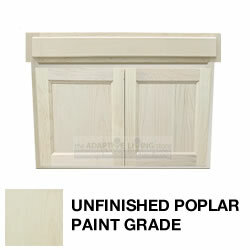 Wall Mount ADA Compliant Wheelchair Vanity Cabinet, Unfinished Paint Grade, choose Flat Panel or Raised Panel Door style. Orders ship via freight. Please allow 2-4 business days for most freight delivery.